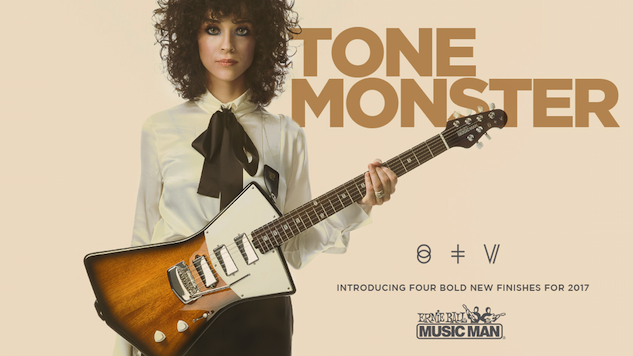 We cannot get enough of St. Vincent in 2017 (or ever, really), so we are super excited to report that Annie Clark and the iconic instrument engineer team at Ernie Ball Music Man have announced a line of St. Vincent signature guitars. Envisioned and designed by Clark with support from Ernie Ball, the eye-catching electric guitar is as badass as its creator. The model first debuted as the Ernie Ball Music Man St. Vincent model at the 2016 NAMM trade show. Since then, the guitar, described by Guitar Player as “nearly flawless,” has become an instant best-seller and requested by artists such as Beck and Taylor Swift. You may have seen Clark rocking the Polaris White—or, as Clark calls it, the “Thin White Duke”— model on this month’s issue of Guitar World. You can see the ground-breaking, sexism-defying cover below. Starting Mar. 3, The St. Vincent Signature Collection will now include four new colors: Heritage Red, Polaris White, Stealth Black and Tobacco Burst. The St. Vincent signature collection features an African mahogany body, Ernie Ball Music Man tremolo, gunstock oil and hand-rubbed rosewood neck and fingerboard, St. Vincent inlays, Schaller locking tuners, 5-way pick up selector with custom configuration and 3-mini humbuckers. The guitar also comes complete with Ernie Ball Regular Slinky guitar strings, and will retail for $1,899. On Jan. 25, we will see the release of the slightly more affordable Sterling By Music Man model, available in Classic Blue (Vincent Blue) for $599. For backstage footage of Clark’s Guitar World photo shoot, click here, and for a video of Clark discussing the forthcoming collection and Ernie Ball, click here. Below you can find a promo video of the collection and nine newly released photos. If that still isn’t enough St. Vincent for you (and trust us, we understand), you can also check out Paste Cloud video from St. Vincent’s 2009 performance at the Great American Music Hall in San Francisco. If that still isn’t enough (again, no reason to be embarrassed), read up on Paste’s review of St. Vincent’s latest album here.